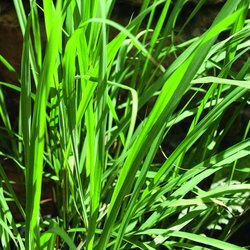 Lemon Grass has long grass like thick leaves with a brownish/green bulbous base with a beautiful lemon smell and grey blue thistle like flowers. The stems are commonly used in Thai&comma; Chinese and Indian dishes. Always remove stems before serving. June to September. Regular cutting will encourage new growth.